Hayley Rose is a #1 best-selling, award-winning author, dedicated to brining fun, educational and interactive books to kids. Hayley has been entertaining and educating children across the country since 2002. Her range of educational, interactive concept books have earned over 50 national and international book awards and cover subjects ranging from manners and kindness, to math and geography, to music and emotions. School presentations include curriculum for teachers grades K-4th. Over the years Hayley has been invited to speak at book stores including Barnes and Noble, Borders and Bookmans, and for the last few years Hayley has been a featured author at the Children's Learning and Play Festival which garners crowds of 10,000 and up. Hayley was recently interviewed on the Author Learning Center alongside authors Stan Lee and R.L. Stine, and she had the honor of presenting keynote presentations for the Readers Favorite International Book Awards and the Desert Nights, Rising Stars Conference among others. Hayley is an active member The Society of Children's Book Writers and Illustrators, the Scottsdale Society of Women Writers and the Florida Authors and Publishers Association. 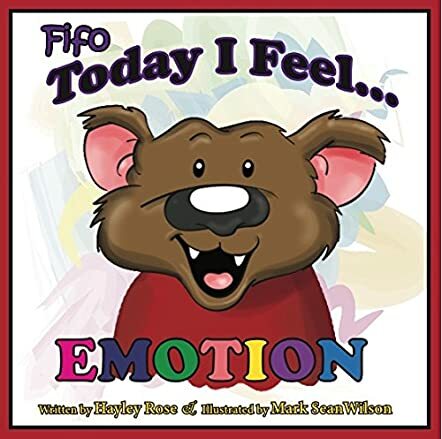 Today I feel... EMOTION is from the Fifo children’s book series written by Hayley Rose and illustrated by Mark Sean Wilson. While playing on the swings at the park, Zack and Chloe wonder where their friend Fifo is. Little do they realize that he is all alone, experiencing a whole world of emotions. Fifo experiences fear, anger, boredom, excitement, sadness and more until his young friends arrive, giving him the best feeling of all – the feeling of being loved. I very much enjoyed the setup and presentation of this literary children’s treat. Not only does Hayley Rose show the different types of emotion a child can feel, but Mark Sean Wilson’s illustrations allow the reader to see what each emotion may feel like through facial expressions. In doing so, the reader can acknowledge when a friend or family member is feeling a certain way, when they might need to talk, need to vent, need a hug, or simply need a friend. Today I feel... EMOTION is a marvellous concept which not only allows children to see the different emotions we all feel, but also allows them to examine how Fifo might be feeling and display curiosity and empathy as to why. What I especially enjoyed was the alphabetical aspect, so that young readers who are also having problems with remembering the alphabet can see the pattern beginning to appear as each emotion is displayed. I recommend Today I feel... EMOTION to be read to (or by) young children aged 3-7 who are discovering their own feelings within themselves, while also interacting with others who display the body language that different emotions bring.